S I G N & D I G I T A L G R A P H I C S • August 2018 • 51 First Version Here is the first version of UGIS. It includes three modules: The Basics, The Method and Five Good Habits. GTH, which stands for Glass, Triangles and Hinges, is the heart of the system as it serves to anchor a panel in the right spot and then neutralize wrinkles. The basics cover the fundamentals: squeegeeing, cutting and heating. The five good hab- its fine tune UGIS by eliminating tension without heat, using the right techniques to avoid overstretching and how to lower install times. 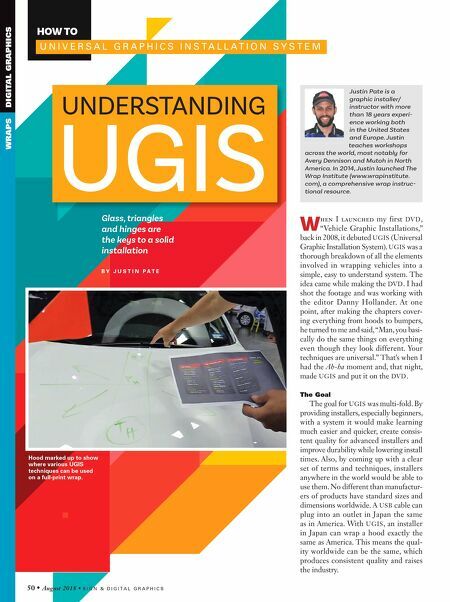 I used UGIS for years in all my work- shops worldwide and saw that it reso- nated with installers as well as owners/ distributors. Leo Maher, owner of Sign and Digital in Ireland, said that one of the reasons he liked to have me teach workshops for his customers was that I offered an easy to understand system that created a common language for his sales staff and customers. Yet, last year, I had another Ah-ha moment. When I created UGIS in 2008, the only game in town was full-print dig- ital wraps. 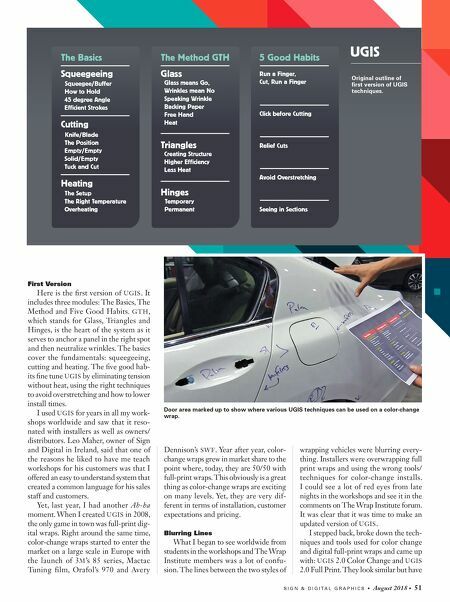 Right around the same time, color-change wraps started to enter the market on a large scale in Europe with the launch of 3M's 85 series, Mactac Tuning film, Orafol's 970 and Avery Door area marked up to show where various UGIS techniques can be used on a color-change wrap. Dennison's SWF. Year after year, color- change wraps grew in market share to the point where, today, they are 50/50 with full-print wraps. This obviously is a great thing as color-change wraps are exciting on many levels. Yet, they are very dif- ferent in terms of installation, customer expectations and pricing. Blurring Lines What I began to see worldwide from students in the workshops and The Wrap Institute members was a lot of confu- sion. The lines between the two styles of wrapping vehicles were blurring every- thing. Installers were overwrapping full print wraps and using the wrong tools/ techniques for color-change installs. I could see a lot of red eyes from late nights in the workshops and see it in the comments on The Wrap Institute forum. It was clear that it was time to make an updated version of UGIS. I stepped back, broke down the tech- niques and tools used for color change and digital full-print wraps and came up with: UGIS 2.0 Color Change and UGIS 2.0 Full Print. They look similar but have UGIS 5 Good Habits Run a Finger, Cut, Run a Finger Click before Cutting Relief Cuts Avoid Overstretching Seeing in Sections The Method GTH Glass Glass means Go, Wrinkles mean No Speaking Wrinkle Backing Paper Free Hand Heat Triangles Creating Structure Higher Efficiency Less Heat Hinges Temporary Permanent The Basics Squeegeeing Squeegee/Buffer How to Hold 45 degree Angle Efficient Strokes Cutting Knife/Blade The Position Empty/Empty Solid/Empty Tuck and Cut Heating The Setup The Right Temperature Overheating Original outline of first version of UGIS techniques.